Moderate, good for nano reef keepers with at least 6 months experience. Banggaii cardinals get along with their own kind, as well as with other peaceful tank mates. However, two males should not be kept together as they will fight. They like to be seen in the open at all times, and will get to recognize you when you enter the room. They can sometimes be shy when first introduced to a new tank, but it quickly goes away. Livebearers, shrimp and other fresh and frozen meaty foods are the best choice for these fish, and good starter foods to train them onto frozen foods. They will rarely accept flake or other dry processed foods, which should be avoided because they will not provide proper nutrition. If your new fish is not accepting the foods you have, you can usually get them eating with Mysis shrimp – a fatty crustacean. After they are eating this, introduce other foods into their diet. Avoid feeding the mysis for long periods of time as it has poor nutritional value. 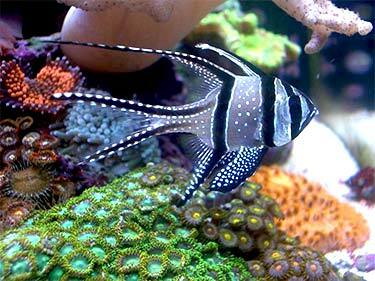 This fish has black stripes with white speckles and a white body, along with rather ornate fins. These fish will do well in groups, in a nano reef a pair is recommended, and breed readily in captivity. They have special swim bladders that allow them to ‘hover’ with almost no discernable movement.While most cardinal fish are nocternal, banggaii cardinals love daylight. Banggaiis are mouth brooders. The male carries the fertilized eggs in his mouth until they hatch, and will not accept any food. He then continues to carry the developing fry until such time as they are big enough to venture out on their own.